Seven watershapes on three levels, each one as dramatic as the next? The concept alone is breathtaking, report Claude Kershner IV and Jeremy Guillen, who say a great design and a superb project team gave them exactly the support they needed to deliver perfection. When you step up to tackle what might possibly be the most challenging job your company has ever pursued, there’s definitely a gut check involved. Do you have the required staff? Can you call on top-flight subcontractors? Do you have the stamina to get involved and stay involved for the duration of a seriously long, seriously complex project? As we found in building the seven watershapes described below, we had everything it took internally to get the job done. But what we learned right up front is that there is another key question to ask before making a commitment to any exercise on this scale: Will you be joining a great project team? It’s really easy to talk about the value and importance of teamwork and the mechanics of setting aside time for meetings, for example, or developing systems for resolving conflicts. But in a project like this one, where the stakes are high, the tasks are literally monumental and site access is severely limited, we could see huge potential problems lurking around almost every corner and knew we had to count on an unusually intense spirit of collaboration to make it all work. In this case, we found that the group of professionals gathered to get the job done was fully open to the required levels of cooperation and communication: With careful planning, great construction documentation and countless meetings, everything came together more smoothly than we could reasonably have expected – and more spectacularly. 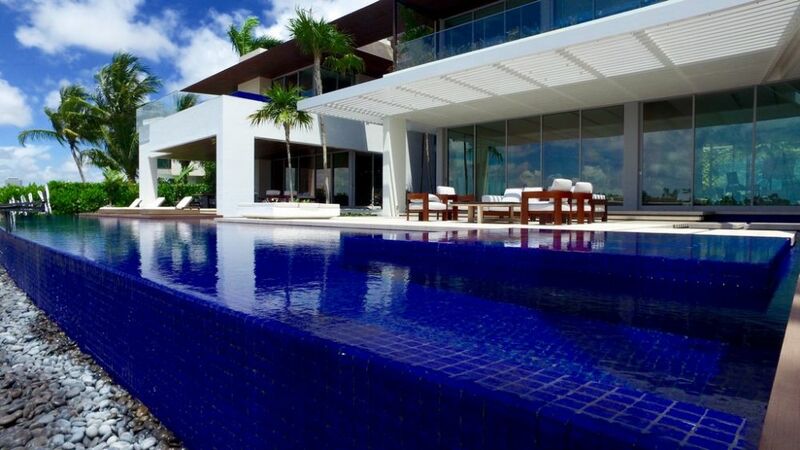 Indeed, we found ourselves breaking the barriers of what we thought was possible in pool construction and, in the process, prepared our company to continue defying expectations and delivering even more exceptional results. Glorious! 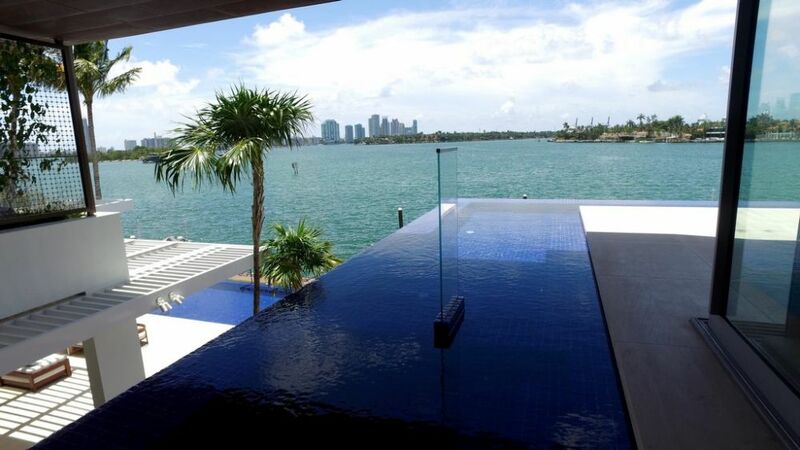 The two-level home sits on a waterfront parcel along an extremely desirable stretch of Miami Beach, Fla. To maximize the size of the structure, it was essentially built out to the setbacks; as a result, access was always going to be an issue as was any level of on-site material storage or staging. 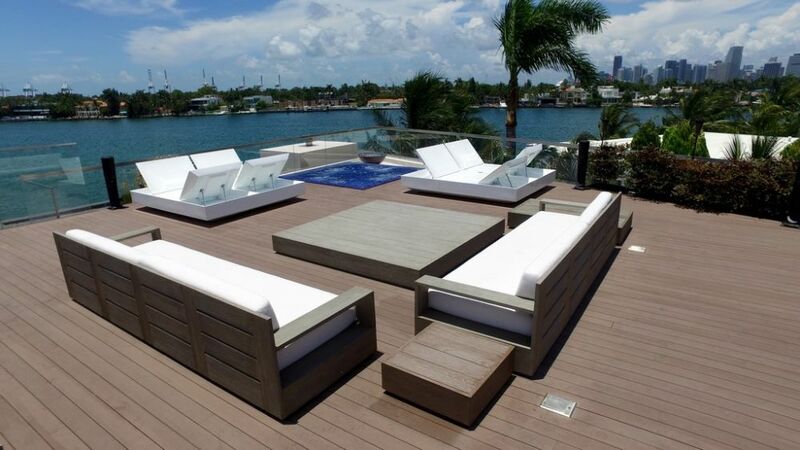 This meant that deliveries often came by barge – which was the case with the stainless steel spas and plunge pool that we installed on the second and rooftop levels. The client was deeply involved in the initial design process and became fully engaged again as the finishing touches were being applied. But for the most part, on-site operations were monitored by his property manager and owner’s representative. 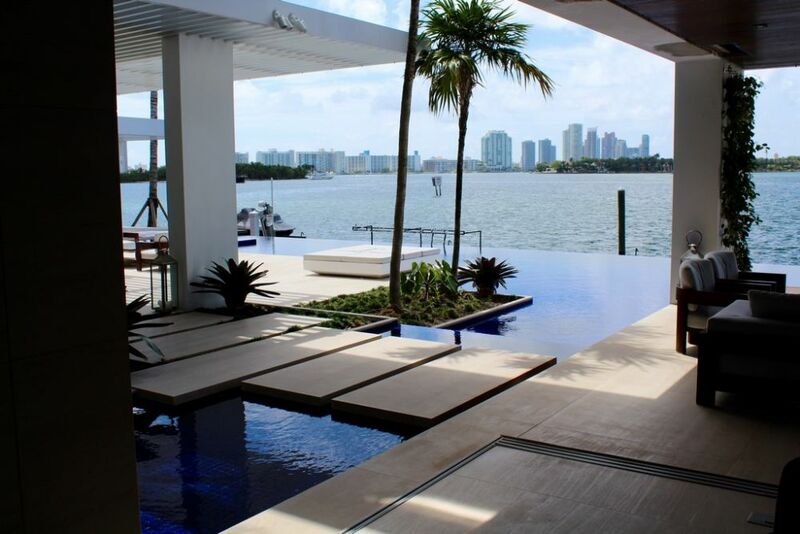 We at Reef Tropical Pool & Landscape (Key Largo and Florida City, Fla.) were brought in at the recommendation of Aquatic Consultants (Miami), with which we’ve worked several times in the past and which knows our broad skill set. 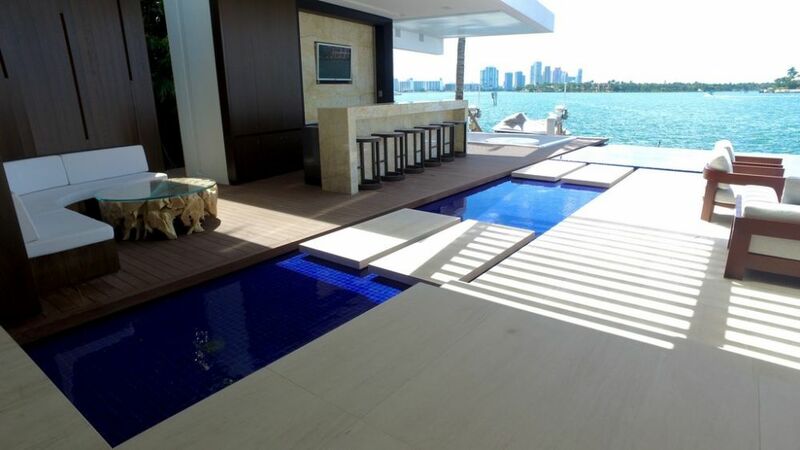 On site, we coordinated our activities with the general contractor, Brodson Construction (also of Miami), with our marching orders being to execute Aquatic Consultants’ design, which had been completed with engineering support from Watershape Consulting (Solana Beach, Calif.). The pipes and conduits running up through the thick, concrete walls all had to be mapped and placed with great precision, but that was fairly straightforward compared to what we had to do to connect them all to the rooftop spa’s pre-plumbed features once that unit was craned into place. 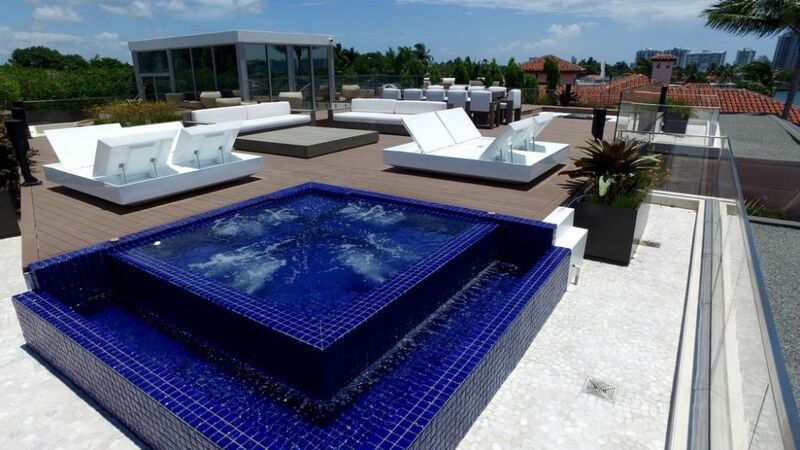 Now fully tiled with upsized pumps for greater hydrotherapy action, the spa is a gem on a rooftop fully equipped for entertainment and relaxation. We design most of our projects, but in this case, our input came mostly in value engineering and through suggesting some appropriate alterations, many of them focused on the systems’ eventual serviceability. There was also the fact that time between plan completion and construction was so prolonged that a number of code and rule changes went into effect (not to mention some product developments). This was enough to send us back through the plans with a fine-toothed comb to identify any adjustments we might need to make and clear with the rest of the team. 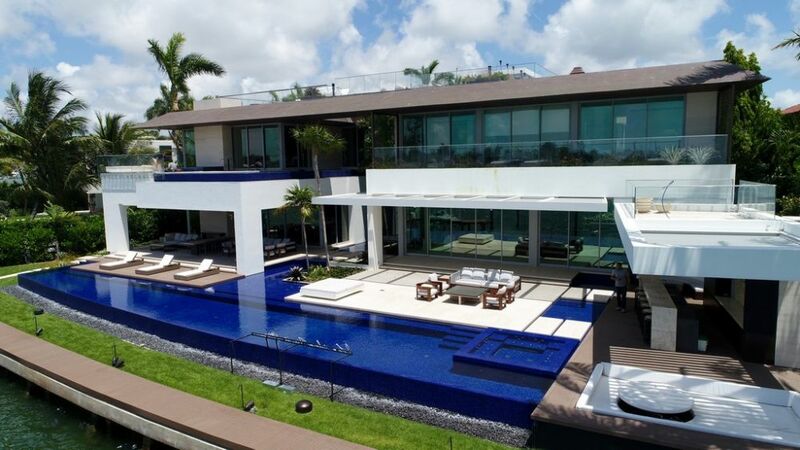 The design itself was incredibly dramatic, with water everywhere. On the rooftop would be a spa; on the second level would be another spa as well as an L-shaped plunge pool located alongside the master suite; and on the ground floor would be an expansive swimming pool that was to include a large spa and be flanked by long, shallow reflecting pools. 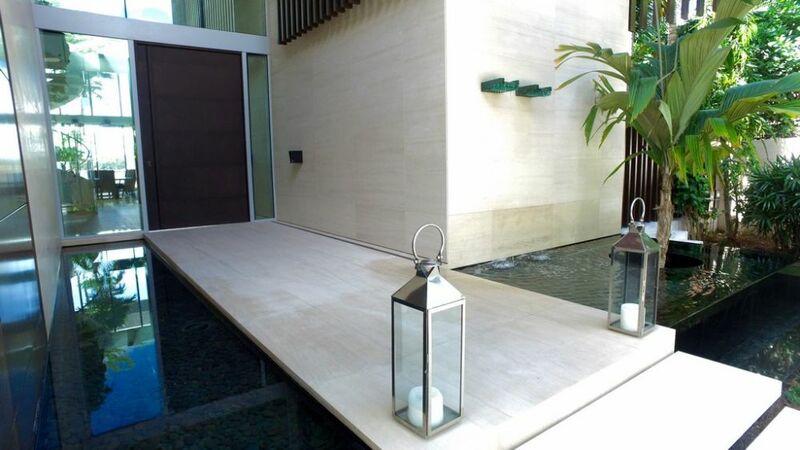 The plans also specified a large Koi pond in the core of the home and a cool vanishing-edge waterfeature out front. The watershapes on the second level – a spa and an L-shaped plunge pool, both stainless steel with vanishing-edge details – had to be craned in with care to positions beneath the home’s roof and eaves. The pool came in multiple pieces to aid the process, but there was lots of welding to do once the component parts had been wrestled into position – not to mention hundreds of square feet of tile to apply! The home was to be made of poured concrete, which meant that every precious available inch of space for plumbing lines, conduits, ductwork and whatever else would be needed to serve the needs of the big home had to be mapped out and allocated within those walls with great thoroughness and precision. In a sense, each of the contractor teams on site was put in the position of defining and then defending what they needed as each section of the home was being built. It was in these relatively early stages of the process that the overall project team coalesced around a collective will: There was so much to be negotiated, so much potential for conflict and so much pressure to keep moving forward that we all had to figure out ways to get what we needed without infringing too much on the needs of others. Frankly, it worked because we all knew this project could’ve gone radically (and expensively) off the rails if we hadn’t all been careful and respectful of each others’ requirements – while of course being somewhat protective of our own. This was also a time when we learned personally that the need for attention and on-site supervision was non-stop and never-ending. Needless to say, we kept our eyes constantly on everything we could see happening with and around our crews: The last thing we ever wanted was to be surprised by anything. As a sign of how well things actually went, we note with pleasure that there were no chip-outs associated with our work on the second-floor or rooftop watershapes – meaning we had few problems that couldn’t be resolved fairly easily. In fact, the main challenge was managing the many subcontractors we brought on site: Keeping them focused, dedicated and on schedule across such a complex, time-eating project was an ongoing challenge; we have to think that the prestige value of this project is what helped keep everyone on the right page. As it turned out, all the teamwork paid off. We didn’t make it through without stressful moments, such as when an overly enthusiastic irrigation crew cut a couple of our lines in preparing for turf installation. But that was beyond the concrete foundation and the repairs were routine – nothing like the potential nightmare of dealing with the absence of even a single plumbing run or conduit leading to the rooftop spa! As was mentioned above, access was a huge site issue and was particularly problematic for us because a six-foot-wide strip along one 100-foot-long side of the house was to serve as our equipment pad. That seemed like a generous space at first, but by the time the plumbing was placed and the pad was shot, we’d stubbed up an obscene number of pipes and conduits to handle circulation and treatment of the water for seven separate watershapes and had to keep all of them under constant pressure to make sure none had been kicked or bashed or otherwise assaulted by crews moving things along the narrow remaining width of passageway alongside the house. The lower level’s watershapes were made of concrete, but the upper-level spas and plunge pool were stainless steel: Once they’d been manufactured by Bradford Products (Wilmington, N.C.) and we were ready for them, they were barged to the site and craned into place. 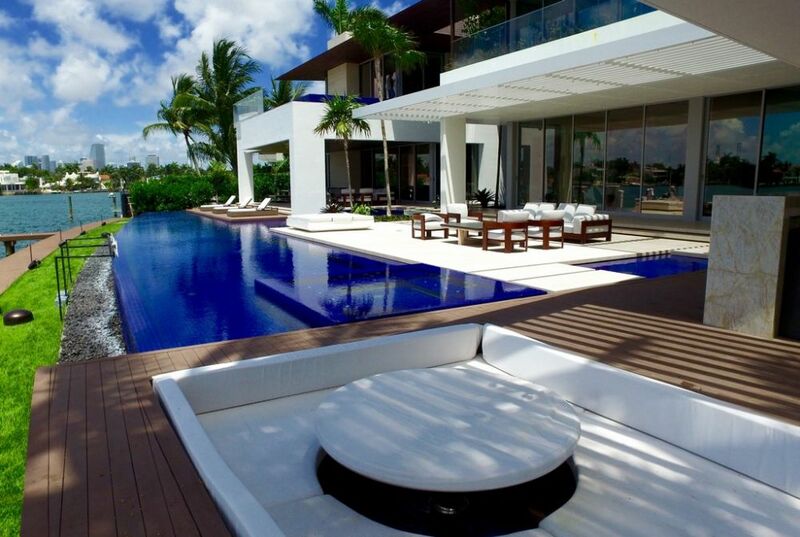 The bottom level is truly dedicated to water, starting out in front of the house with a reflecting pool on the left side and a unique dual-vanishing-edge pool on the right, where water flows over the front edge and into a well from which a palm tree emerges. 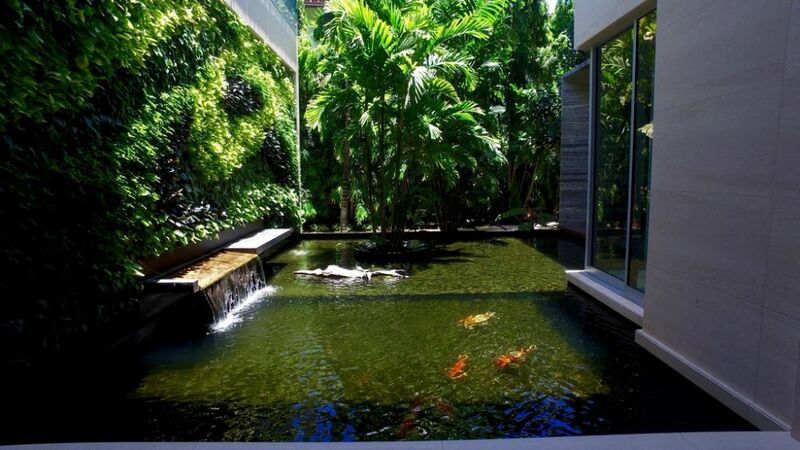 Within the home is a large Koi pond with a large spillway that spreads wonderful sounds through the interior space, while in the back, the eye is led out to the large swimming pool by several smaller reflecting pools. The top-level spa was easy enough to position, but the second-level vessels were, for the most part, tucked beneath the roof and eaves. As was the case up above, the second-level spa had a perimeter-overflow system, which made these shells unusually cumbersome because of the catch basins integrated into their structures. Swinging one into place on the second level therefore took unusual patience and care. The stainless steel plunge pool, happily, was delivered as two pieces to be welded together on site. But one of them was to be placed entirely within the structure under the roof system. When the time came, every single member of our very large crew was involved in sliding and wrestling that one into place. The L-shaped pool came together perfectly, but the concentrated effort involved in making it happen isn’t anything any of us will soon forget, with the huge and heavy shell gently swinging up there above the deck. 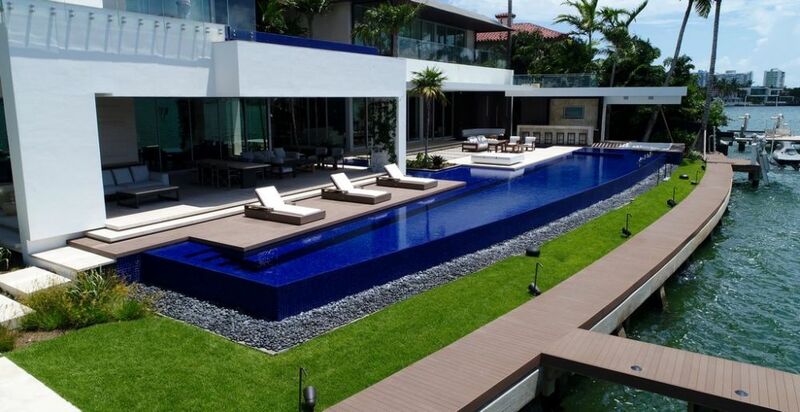 But building the lower-level pool came first. It’s 92 feet long but not very deep or wide; in fact, the entire pool along with the small reflecting pools that branch off the main body include only 37,500 gallons of water – not a lot considering the composition’s immense footprint. 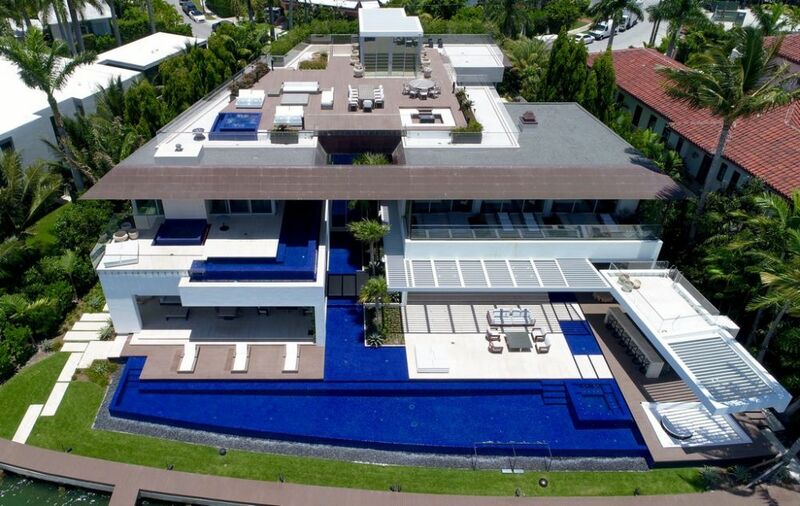 The tile here and on the upper levels was supplied by Soli Architectural Surfaces (Los Angeles). 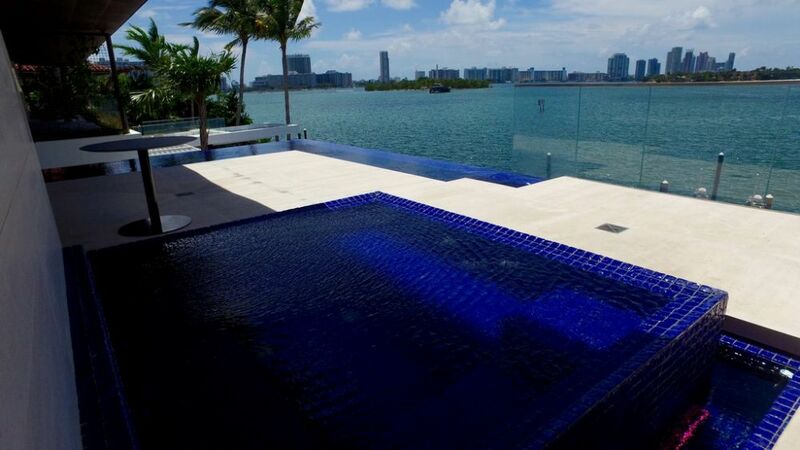 Working on the bottom-level pool was actually something of a relief compared to the intricacies of the upper-level tasks – but it was utterly huge, with a 92-foot vanishing edge that had to be perfect along its full length. 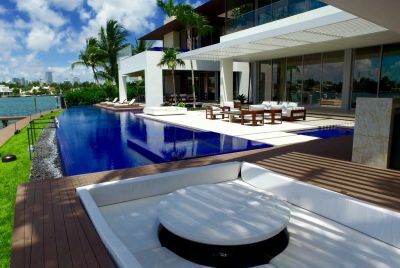 Now it’s beautiful from every angle – especially from seating and entertainment spaces in a grand indoor/outdoor room that’s every bit as spacious and welcoming as the home’s rooftop paradise. The Koi pond also took shape early in the project – a process much aided by Koi specialists we retained to make certain the environment met the needs of these valuable fish. 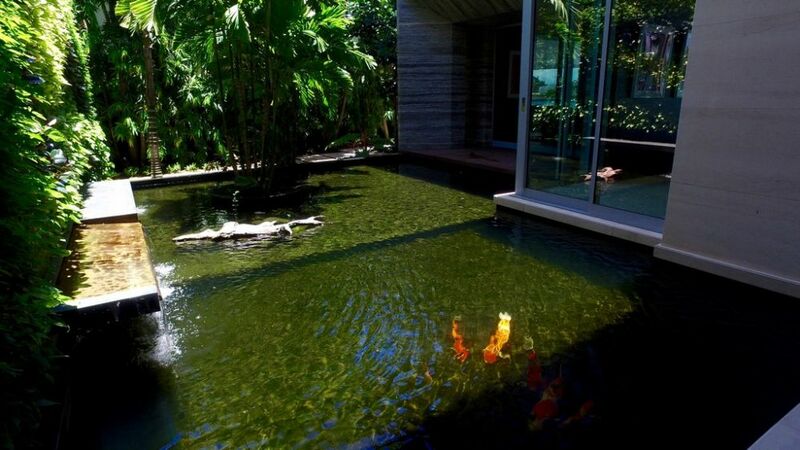 The pond flows through the core of the structure on the first level in an area that’s flooded by natural light but also gives the fish the shade and shelter they need to thrive in south Florida. The agitation required to aerate the water and keep the fish healthy is provided via a broad spillway. 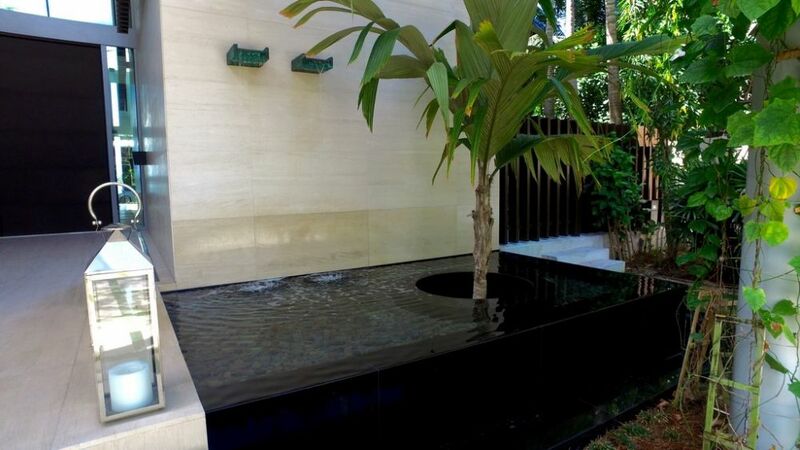 Out front is another waterfeature with an interesting dual-vanishing-edge detail, one flowing away from the house and the other into a well holding a palm tree. Two elevated scuppers (from Bobé Water & Fire Effects, Phoenix, Ariz.) augment the sounds of moving water and help to define a clean break between the street and the home’s interior. As things started coming together – home-stretch time in what turned out to be a three-year project – the homeowner became quite active when it was time to assess finishing touches. 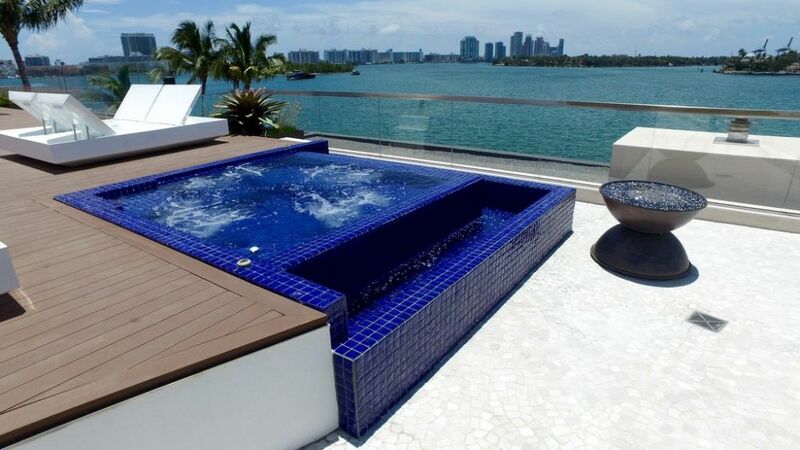 For one, he found the performance of the stainless steel spas didn’t align with the strength of the hydrotherapy system we’d installed in the in-pool spa below. There wasn’t anything we could do with jet configurations or arrays at this point, and he accepted that reality. But this didn’t keep him from asking us to replace the pumps to beef up the jets’ power. Here and in a whole bunch of other small ways, we were able to make adjustments that pleased him – and managed to do so without significant alterations to work now buried in tons of concrete. The equipment pad is truly a masterpiece of spatial organization: pumps, filters and water-treatment systems for seven watershapes, four of which included vanishing edges. 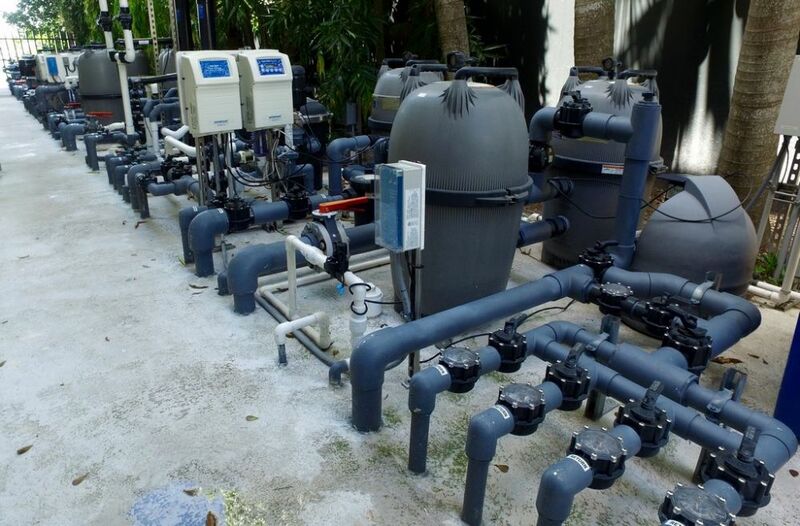 (The pumps, filters, valves and control systems all were supplied by Zodiac Pool Systems’ Jandy division, Vista, Calif.) Each system was set up separately, with the pools and spas operating with AutoPilot saltwater-chlorination systems (AquaCal, St. Petersburg, Fla.). Our firm is also in the service business and will be taking care of all of these systems for the homeowner. It’s a point of pride in our construction unit that we set our equipment pads up for serviceability – but in this particular case it was an elusive goal as the project wound down. Although the mapping had been perfect and all of the lines ended up right where they needed to be, physically fitting everything in the allotted space took nearly six weeks of concentrated effort and juggling. At approximately 100 feet long and six feet wide, the equipment pad is beyond immense. As we worked in and around it, we made certain that all of our plumbing runs were always pressurized: Access was so limited that we had to worry constantly about our pipes being bashed by other trades moving back and forth along this long corridor, which now holds all of the systems required to run the home’s seven major watershapes. It’s all there and workable, but there are a few configurations where we’ve left our service department some contortionist-friendly challenges we’re sure we’ll be hearing about periodically for years to come. We can take that in stride, of course, because otherwise we sought and achieved just the sort of perfection the client and the entire design team were after when the project began. In making it work, special credit and thanks must go to Brian Van Bower and Andrew Kaner at Aquatic Consultants: Their design was otherwordly, their construction documents clear and specific and their willingness to answer phone requests and work with us on site went above and beyond expectations. It was a great working relationship – and every bit as valuable to us as the one we developed with personnel at Brodson Construction, particularly their on-site project manager, Alex Trench. His capacity to manage and schedule the activities of so many trades and crews working in such a constrained and complicated space helped keep things moving and on track from start to finish. 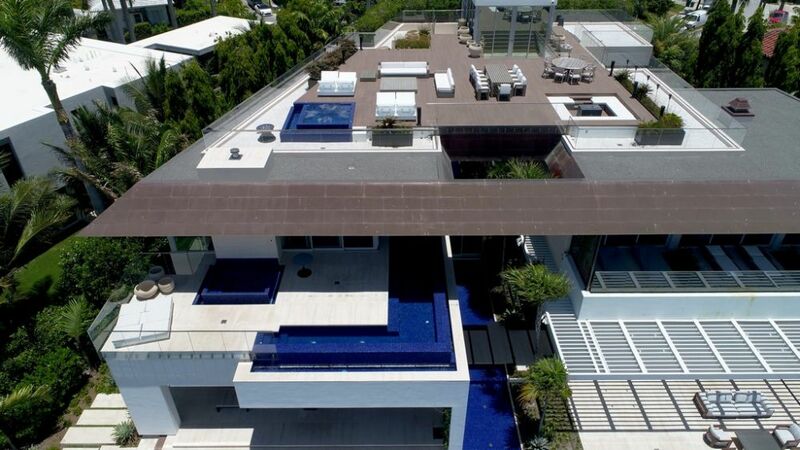 Although the spas, pools and other watershapes all look great from the usual, grounded perspectives form the home’s interior and its many deck areas, there’s something special – and inspiring – about seeing the entire composition with a drone’s-eye view. The project was brimming with challenges for us as builders, but it was all worth it in pursuit of a fantastic design in a fabulous setting. We look back on this project as though we’d been thrown a huge jigsaw puzzle in which the pieces kept changing color and shape – a visual moving target. Our key to success was careful planning that required us to know, at every step and turn along the way, exactly what we needed to accomplish and what was expected of us by those working all around us. It’s easy to talk about professionalism and meeting commitments and communicating; it’s another to make it work through the course of a monumentally complex construction process. This is exactly the type of project that we have prepared ourselves to tackle with years of hard work – and exactly the sort of challenge we’re always poised to undertake. In this case, we were asked to channel the very best in custom watershaping, apply the education we’ve received through top-flight industry programs and open ourselves up to the needs of our fellow team members and the client. On some level, making projects of this nature work involves setting aside pride and pursuing collective rather than individual achievement. Our success here is therefore a reflection of the team’s strength: We all made some mistakes along the way, but nothing bent us away from our goal of achieving general excellence – or from growing as professionals under most challenging circumstances. It was a win-win-win situation for us, for the project team and for the client: Glorious! For a brief video tour of the completed project, click here.